Petroleum Service Agreement for developing Issaran Field with Scimitar. 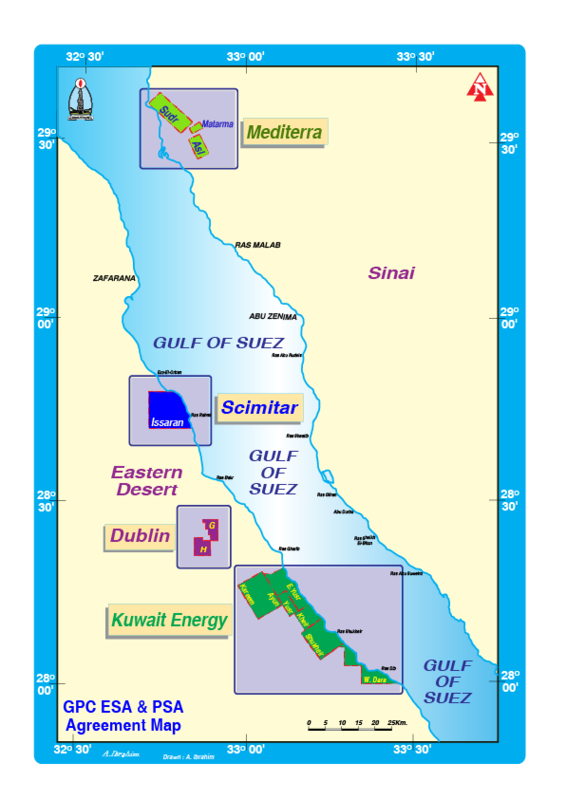 GPC contracted with Scimitar as a heavy oil development contractor in Essaran Field on November 4, 1998, with the objective of applying the Enhanced Oil Recovery (EOR) and maximizing the reserves that could be developed. Applicable development axes were used according to modern technology in the production of high velocity heavy oil and enhancement of field reservoir production. Steam injection experiments were made with positive results on 30/7/2001. The commercial development announcement of the project was declared on 18/10/2001. The original recoverable reserves of Issaran Field were maximized to rise from 2.9 million barrels by the end of 2003/2004 to reach 41.6 million barrels on 30/6/2017. Exploration Service Agreement for West Gharib Exploration Area - Block G & H with Dublin Petroleum Limited. Undoubtedly, the successful joint cooperation system has greatly contributed to the achievement of many oil discoveries. This, in turn, has resulted in the increase of production and reserve rates through the application of modern techniques and developed geological theories. GPC experiment in the field of petroleum agreements literally imposes itself as a model of success for the whole oil sector.